Every year for 34 yrs and going strong, West Chester Chamber of Commerce puts on a spectacular parade. 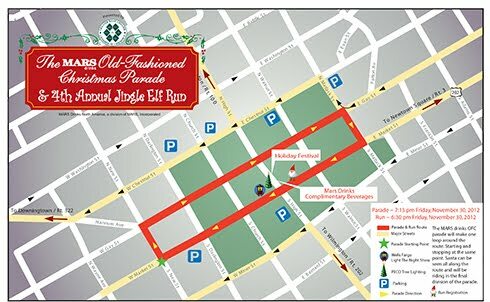 This year the parade will be held tomorrow night, Friday, November 30, 2012 at 7:15pm. Filled with excitement for all ages and entertainment from local High Schools (Chester County and Delaware County), Colleges/Universities and businesses. “The parade was recently named by USA Today as one of the top ten places to experience the arrival of Santa Claus during the holiday season. With about 30,000 spectators tightly lining the 1 mile route, it makes you feel like you are on Main Street USA.” Besides the arrival of Santa, another attraction is the High School marching bands who have the opportunity to compete and win a portion of more than $5,000. Who will win this year? Last year it was Downingtown High School, will they stay as the Honor Band or will they be replaced? So, what does this parade mean to me? Family, fun and the Holidays! Every year for the past 4 years, my family (3 generations) meets at my sister and brother-in-law’s house in town and have dinner. Then, around 6:45pm we walk up to Gay Street to claim our spots to watch the parade, usually catching the last part of the Elf run. We decided to start going when one of my sisters and I started families and wanted to get the kids and families involved. We love to see all of the local entities involved, even our old High School and most importantly the arrival of Santa at the end. If we ever get cold, which is quite often, Mars Drinks offers FREE Hot Chocolate and other warm drinks to help warm you from the inside out. It is a fun-filled night for us all and this year is expected to be just a wonderful as years past! Bundle up, go early to get a parking spot and a parade spot (streets of the parade route close at 5pm) and prepare for a great night!!! For more information, please check below or follow the link to the West Chester Chamber of Commerce‘s web site and see what else is going to through out town! Don’t miss all new this year our Patrotic Division “Celebrate the Military” with appearances by the US Air Force, US Coast Guard, Welcome Home Vets float, Silver Dolphins Drill Team and more! Last but not least, Santa makes his arrival to West Chester! 5:30pm- Registration at First Niagara Bank- 16 E Market St.
6:30pm- Kids 6 and under 200m. 6:35pm- Kids 7-12 – 1/2 mile.